Installation: Should it hang from a tree limb? Or would it be better to be mounted atop a post? Maybe you would prefer it right in your window? Bird Seed: Will the seed you use attract the type of birds you want? Quality: Will it last a season or for SEASONS? Maintenance: How often do you need to refill and/or clean your new bird feeder? Looks: Does it need to match your backyard theme? Is there a particular color or finish you that suits you best? Pests and Mold: How well will your new bird feeder deal with squirrels and raccoons? How effective will it be in keeping mold and bacteria at bay? Choosing the right bird feeder for you will add character to your outdoor space, help support local birds, and give you and your family enjoyment for years to come. 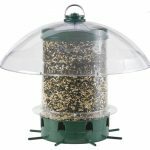 Our list of the best bird feeders will help you sort through the marketing and sort out the junk from the jewels! 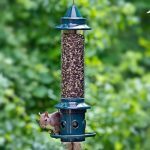 If you have had enough of watching squirrels scare birds off your feeders, then it is probably time to invest in an anti-squirrel bird feeder. The results vary as many companies claim to be squirrel proof. In our reviews, we find that squirrels always seem to find a way. It is a matter of which feeder offers the best chance of deterring squirrels most often. It isn’t easy calling the Brome Squirrel Buster Plus the best squirrel proof bird feeder. Afterall. there are dozens of options from many companies with all kinds of engineering and technology. Let’s just say if we took a sample of 100 back yard bird enthusiasts and asked them how they keep the squirrels out when naming a specific feeder the majority would go with the Brome Squirrel Buster Plus because it just works. It is made from highly durable components, a great seed capacity, dishwasher safe components, and a lifetime warranty. Hard to beat and we couldn’t find another squirrel proof wild bird feeder that could with such a well-rounded pedigree. Cardinals prefer foraging for food on the ground or in shrubs bushes. Setting up a feeder to replicate it is difficult due to squirrels, bugs, and the lack of a clear line of sight for you in many cases. This is why many people who are looking to attract cardinals choose a hybrid open-air platform feeder. We found that the Droll Yankees X1 Seed Saver wit Dome offered a nice combination to keep maintenance low and to offer the creature comforts that will attract cardinals to the feeder. It features an open-air feeding tray, a 12″ dome that serves to keep squirrels out and protect the feeding area from the elements. It will accommodate any variation of seed, suet, or fruit that you choose to use. It also has drain holes to keep the water out. The X1 Seed Saver also is adjustable so that you can raise or lower the dome to limit the impact of weather and also to keep larger birds out. 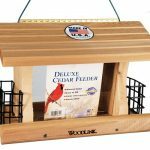 Ultimately, the high-quality construction, flexibility, and features that are specifically inviting to cardinals really shine with the Droll Yankees X1 SeedSaver Domed Feeder compared to other options. Attracting finches is quite different compared to other types of birds. It is generally a good rule to use nyjer/thistle seed which requires a specialty feeder due to the seeds small size and shape. The nyjer thistle feeder from Brome is a durable finch feeder that features a cage that is weight sensitive. When small birds visit they easily can feed on the small seed, but when a squirrel visits, the ports close as they add weight to the powder coated metal cage that surrounds the feeder. 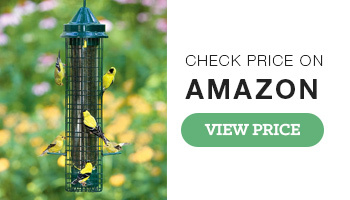 With a polycarbonate tube and metal top, bottom, and perches it is a well-made finch feeder that will help attract finches and discourage other birds. It is important to note that this feeder will only work with thistle/nyjer. It is not designed for larger seeds which finches generally do not prefer. Suet generally compliments your seed feeder by attracting birds that may not be the same birds that you usually see. Suet is known to attract woodpeckers, chickadees, jays, warblers, thrashers, and others that don’t always visit seed feeders. Suet is generally best served in a cage. But a hanging cage isn’t ideal for many birds because there isn’t a simple way for birds to balance while feeding. That is why most people rave about suet feeders with a tail prop. There are several versions from many companies but the one from Rubicon is by far the most well regarded for its weatherproof black vinyl coated suet cage and its outer case made from recycled milk jugs that will not fade, peel, rot, crack, chip, or warp! It weighs 3lbs before filling, measures 7.5″ x 2.5″ x11.25″ and allows feeding from both sides. 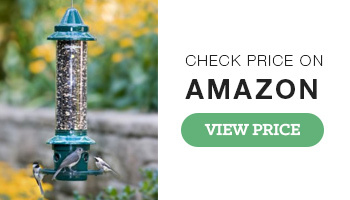 With quality that is unmatched, a 100-year guarantee, and a simple to fill/clean design, the Rubicon Suet Feeder w/ Tail Prop is our pick for Best Birdfeeder for Suet. Hummingbirds are some of the most beautiful backyard creatures you will find. They are wonderfully unique but this also means that their feeders must specifically accommodate their anatomical features and feeding habits. Hummingbirds favorite meal is nectar from flowers, so a good hummingbird feeder does its best to recreate that experience for them. Seeing birds up close is one of true joys in life. Window bird feeders have helped usher in renewed interest in attracting birds to the home and garden. With window feeders, even those who have never thought twice about birds find themselves captivated when a bird flys up to the window. Great for kids, cats, dogs, and even the grumpiest of bird watchers! There are quite a few choices when it comes to window bird feeders. The best window bird feeders are larger and of the box style. 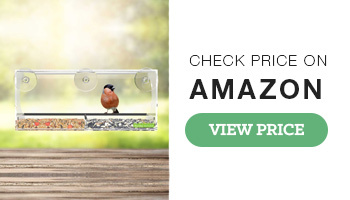 The Yardly Noticed window bird feeder has very durable construction and features a removable tray that makes it easy to empty and refill. Both the feeder box and the removable tray feature drain holes to allow water to find its way out. It also features a long 11″ perch across the front and another 4″ perch inside the feeder to accommodate smaller birds who have trouble reaching the seed. 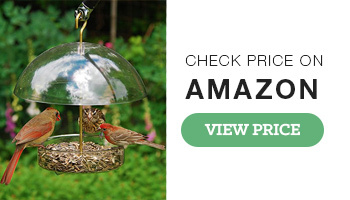 With a money back guarantee and some of the best packaging for gift giving we don’t think you can go wrong with the Yarldy Noticed Window Bird Feeder. 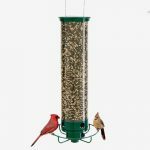 If you are considering a bird feeder, there are quite a few considerations to keep in mind in order to ensure you make the right purchase. We created this brief bird feeder buying guide to help you make a more informed decision with regards to the options available to you. There are literally hundreds, if not thousands of bird feeders available today. Each with its own attributes, application, and usefulness. 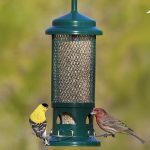 Not all bird feeders are created equal, so its important that you understand the information below because the best birdfeeder for you, may not be the best birdfeeder for your neighbor. Installation – Where Will it Go? If you are new to the world of bird feeders, you may not realize that there are quite a few ways in which you can install them. As you can see, the first decision to consider is how and where your bird feeder will go. It is important to understand that some bird species will prefer certain types of installations. Do your research to make sure the installation you choose will give you the best chance to see the birds you are looking to attract. In the same way that humans favorite foods differ from that of your dog and cat, each bird species has a preference for types of seed, fruit, and/or suet. There are dozens of seed and bird food types available with hundreds of more mixtures of those that seed companies create. Some bird feeders are able to work with a wide variety of feed. Others are specifically designed to dispense certain types of seed. Keep this in mind when looking at the options. For newbies, it may make the most sense to choose a mixed seed bird feeder. This may seem obvious, but quality matters quite a bit with bird feeders. Afterall, this feeder you choose will weather the elements 365 days a year and hopefully see frequent flying visitors. Many people underestimate the importance of quality when purchasing a bird feeder. The materials used in most bird feeders include plastic, polycarbonate, metal, wood, aluminum as well as some other materials. Some feeders are held together with glue, while others are fastened with screws or nails. Some will come with necessary mounting hardware while others will not. Quality is a subjective thing in many cases, yet we believe that overlooking it will almost always leave you unhappy. 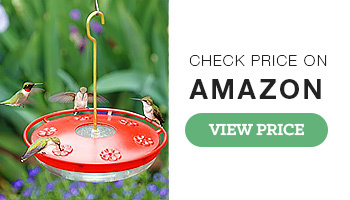 What is a better value: a $20 bird feeder or a $100 one? If your answer was, “it depends” then we agree. We like this definition: “the importance, worth, or usefulness of something.” The only way to calculate the value is to understand the usefulness and importance to you! We do our best here at BestBird.org to make this determination based on a series of data points and most people agree with our determination. However, what may be of value to some, may not be to you. You may find a feature to be an absolute deal breaker if you bird feeder doesn’t have it. That is perfectly acceptable, but the bird feeders which do have it, now are more valuable to you. We hear a lot from bird feeder owners and many are surprised by the frequent need to clean and/or refill their bird feeder. They saved a few bucks but cost themselves hassle and headaches in the process. Bird seed and suet will go bad after a period of time while birds and weather will make a mess of your feeder. If you considered this upfront, you probably decided that the best bird feeders for you were the ones that had a nice seed capacity to limit your refills and were easy to clean. Over the course of a year, the best feeders for maintenance will need to be cleaned 1-2 times and refilled 6-12 times a year while the worst will potentially need to be cleaned 6+ times and refilled dozens of times. Not to mention that a poor quality bird feeder may have parts break which need replacing. Having your bird feeder be aesthetically pleasing has become much more important over the past few years. There are new designs and finishes made available every day. 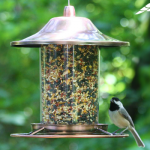 For simplistic needs, you can go with a plastic feeder, but the copper or pewter finish may catch your eye as well. As you might expect, the better the looks, generally the higher the price tag. Chances are you are used to that as that is the case with most of the things we buy. There is more thought going into the look of bird feeders than ever before. You should not have much trouble finding one you like the look of as long as you are willing to pay a premium. If you have an outdoor space then you are certainly aware that many other things live here besides birds. You may have squirrels, raccoons, bears, chipmunks, gophers, foxes, and many more wildlife that call your general area home. Bird seed, suet, and fruit are on the favorite food lists of many of these other creatures and they may try to get access to it. This is problematic for several reasons. They scare away birds and are likely to destroy your bird feeder over time. This is why many bird feeders come with features that discourage or downright block these animals (squirrels in particular) from getting access. The bird feeder itself may have a locking mechanism, cage, pressure sensitive perches, or many other engineered deterrents. You also have the option of installing a baffle. A baffle is essentially just a dome that goes either above or below (or both) your bird feeder that makes any creature that climbs slip and fall off. How your feeder handles sediment, rain, and drainage is also very important. Protecting your feeder from mold and bacteria is important for several reasons. A bird feeder full of mold and or bacteria presents a potential health hazard to birds. It may result in birds not visiting at all. In addition it many force more frequent cleanings and the necessity to waste seed if it needs to be thrown out. Having a bird feeder is a tool that brings enjoyment to nearly everyone. It makes a perfect gift for men, women, children, and even pets. People who have never thought twice about the birds in their yard quickly find a fondness for their bird feeder. Birds are captivating, inspire curiosity, and create wonder in all of us. Let us just say the list of reasons NOT to own a bird feeder is a short one. Choose one of the best bird feeders on our list and get started enjoying a part of life that cannot be experienced online, in a book, or shared through a story!